Agnes & Aron A. Toews, August 1958. Aron A. Toews: teacher and minister; born 22 January 1884 in Alexanderkrone,Molotschna Mennonite Settlement, South Russia to Aron A. Toews (28 September 1841-24 December 1918) and Justina (Reimer) Toews (1 February 1844-12 May 1923). On 9 August 1908 Aron married Agnes Harms (25 December 1886, Friedensruh, Molotschna - 15 March 1978, Abbotsford, British Columbia, Canada) in Friedensruh, Molotschna. Agnes was the daughter of Johann B. Harms (1857-ca. 1937) and Aganetha (Wiebe) Harms (1864-1917). Aron and Agnes had four children: Agnes, Mary, John, and Nicolai. Aron died 5 November 1969 in Abbotsford, BC. Aron attended elementary school in Alexanderkrone for seven years before graduating from the secondary school in Ohrloff. After two more years of studies in pedagogy, he passed the teacher's examination with distinction. He taught in the village school in Kleefeld, Molotschna for three years. Aron was saved at the age of 16 and participated in choir and youth work. He was baptized in 1906 and joined the Rückenau Mennonite Brethren Church. That same year he accepted a teaching position in Friedensruh, where he met his future wife, Agnes Harms. After his marriage Aron and his wife moved to Rückenau where he taught for ten years (1908-1918). He was elected to the ministry in 1914. The couple moved back to Friedensruh in 1918 where he taught for four more years until he was dismissed by Soviet authorities. He then became pastor of the Lichtfelde Evangelical Mennonite Brethren (Allianz) congregation. In 1926 Aron and his family emigrated from Russia to Canada. After a temporary stay near Dalmeny, Saskatchewan, they moved to Namaka, Alberta in February 1927. Here he helped to organize the Namaka Evangelical Mennonite Brethren (later Namaka Mennonite Brethren) congregation and served as its leading minister for twenty years. The congregation joined the Mennonite Brethren Conference in 1942. Aron and his family suffered a personal loss when fire destroyed their home, including his personal papers. Aron is probably best known for his two-volume work, Mennonitische Märtyrer. It began as an attempt to collect information on the fate of Mennonite ministers in Russia during the 1920s and 1930s. Public awareness and interest expanded the project, and Toews received numerous submissions from relatives and friends. Unfortunately, the fire that destroyed his home also destroyed much of his research, but he was able to recover from the loss and the work was published in 1948. In October 1947 Aron and his wife moved to British Columbia where they acquired a small farm in Abbotsford. 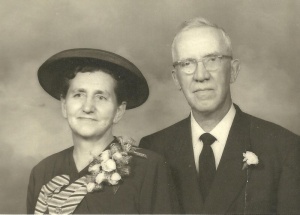 Aron ministered in the Clearbrook Mennonite Brethren Church and succeeded Jacob J. Doerksen as leading minister of the congregation from 1951 until 1954. He resigned due to poor eyesight. Aron suffered a severe stroke on 1 March 1963 and lost his eyesight completely. Mennonite Brethren Herald (31 March 1978): 31. Mennonitische Rundschau (10 December 1969): 1. Ratzlaff, Erich L. ed. The Clearbrook Mennonite Brethren Church: A History of the Clearbrook M.B. Church 1936-1986. Clearbrook: Clearbrook M.B. Church, 1986. Toews, Aron A., trans. by John B. Toews. Mennonite Martyrs: People Who Suffered for Their Faith 1920-1940. Winnipeg, MB: Kindred Press, 1990. Available in full electronic text at: https://archive.org/details/MennoniteMartyrs19201940ocr1. Toews, Aron A. Mennonitische Märtyrer der juengsten vergangenheit und der Gegenwart, 2 vols. Clearbrook, BC: Selbstverlag, 1949, 1954. Ratzlaff, Erich L. and Richard D. Thiessen. "Toews, Aron A. (1884-1969)." Global Anabaptist Mennonite Encyclopedia Online. January 2006. Web. 22 Apr 2019. http://gameo.org/index.php?title=Toews,_Aron_A._(1884-1969)&oldid=163489. Ratzlaff, Erich L. and Richard D. Thiessen. (January 2006). Toews, Aron A. (1884-1969). Global Anabaptist Mennonite Encyclopedia Online. Retrieved 22 April 2019, from http://gameo.org/index.php?title=Toews,_Aron_A._(1884-1969)&oldid=163489. This page was last modified on 10 March 2019, at 01:11.